This workshop is an introduction to Neutral and Larval masks. Participants will have a taste of the basic techniques regarding masked improvisation: levels of presence, economy, sustaining, transition and Le Jeu (game). These techniques enable the performer to understand the value of clarity and precision on stage, as well as the pleasure of playing in front of an audience. The neutral mask helps the performer to get rid of all the excess and unnecessary gesture and movement, to discover the silence and the origin of physical action and to learn that every piece of theatre needs a form. The Neutral mask gives the opportunity to confront one’s own idiosyncrasies and to find the fulcrum point where drama can be inscribed. The Larval mask is the next step after the Neutral mask. This mask allows the performer to explore very simple situations and characters. Larval masks are very subtle and poetic; they can move the audience to laughter or tears with very little effort! This journey into the world of masks is an invaluable opportunity for actors and dancers to discover the subtleties and poetic force of their gesture and movement. 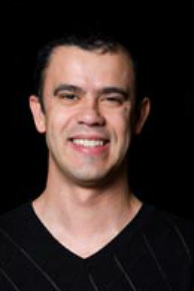 Pedro is a Brazilian actor, theatre director, playwright and researcher of the popular forms of drama with a career spanning almost 20 years. His work is based on a total commitment to a sense of critical respect for theatre history, rigour, physical technique, social engagement and of course the spirit of humour. Pedro started his theatre studies in the early 1990's under the tutelage of the Brazilian theatre director Geraldo Cunha and since then became specialised in a style that might be termed the laughter of the body – a consistent series of de-anxietising physical exercises, improvisations, mask-driven experiments, philosophical study and dramaturgical research that stayed close to the popular roots of theatre in comedy. Out of this intensive development emerged not only a road-tested theatrical methodology but a specific kind of poetic consciousness of the laws of social logic that has became the foundation of his work. Migrated to New Zealand in 2000 and since then has been running workshops and directing productions where the focus is on actor's training and improvisation with a strong emphasis on intention, precision, transition and the poetic development of that most elusive of theatrical qualities - the game. Pedro is the director of LAB: Theatre (Alfonsina, One by One), his theatre company toured around New Zealand and overseas in 2010. His directing credits include The Remedy Syndrome (Chapman Tripp nominee 2005) and Harmonious Oddity (Touch Compass Dance Trust, 2008). He is currently a lecturer at UNITEC – Performing and Screen Arts Department.